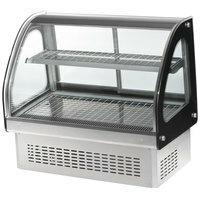 Use a drop-in heated display case at your grocery store, deli, or bakery to keep hot take-out foods warm. Choose from a variety of cabinet sizes to display small to large quantities of merchandise from your countertop. 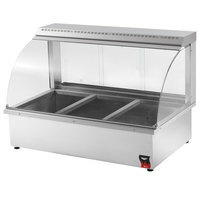 For stores with little space for display cabinets, a drop-in heated display case fits directly into your available counter space. Hold roasted chicken, freshly baked bread, or pre-cooked vegetables at a warm serving temperature so customers can eat them right away. 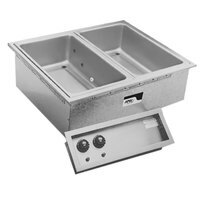 Designed to display both food pans and Bain Marie pots, these warming merchandisers provide crystal clear product visibility and increase impulse sales. The curved glass front panel protects food from airborne bacteria while allowing customers to see your ready-to-eat products. Each drop-in heated display case can hold many types of food pans, so you can arrange your food in a variety of configurations for the best display.